Yes, we've begun our knit-along! Many people have chosen the Aflight pattern in a variety of yarns, both solids and patterns. There's the option of picking Afield or Aflame if those suit your taste more though! All three patterns can be found on Ravelry and can be bought individually or as a collection. 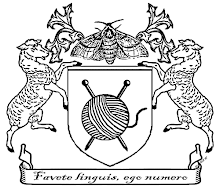 If you're interested in knitting along with us but don't have a Ravelry account, contact me to buy a pattern. Then just cast on and join us here in cyber-space (via your blog, this blog, Facebook, and any other venue you like) or in person on Tuesday nights at The Yarn Spot in Wheaton, MD. I can't wait to see all the socks.